Mountain Weather: Spring to Winter to Spring: Snow for St. Patty's Day! Spring to Winter to Spring: Snow for St. Patty's Day! Hope you enjoyed the Spring weather this week, back to Winter weather in the Pacific Northwest & northern Rockies for Saint Patrick’s Day Weekend. The Ridge of High pressure that brought warm & dry weather this past week to the West & Rockies gets flattened out and a Westerly flow develops from the Pacific Northwest across the Northern Rockies and into the Plains States, with gradually cooling temps. A small, but very strong Low pressure system will move across the Pacific Northwest on Saturday, and be over Idaho Saturday night, with a strong cold front passing thru Western Wyoming on Sunday. This potent little weather system will bring a pretty good shot of snow and much colder temps across the Pacific Northwest . 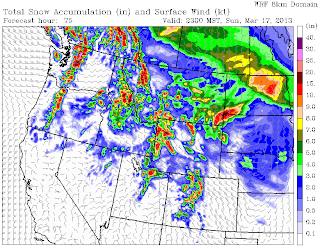 Snow showers linger early next week……..then on Wednesday, the First Day of Spring, a larger Low pressure system moves into the NW US with warmer temps initially, then another cold front plows across the Northern Rockies on Thursday. Bringing more snow & colder temps again the end of the week. Looks like High pressure builds back over us for next weekend, with temps warming again.